In March, KCF Technologies will open an additional office space in downtown State College. Pictured, from left, during the recent announcement are Chamber of Business and Industry of Centre County and Centre County Economic Development Partnership president Vern Squier, KCF co-founder Jeremy Frank, State College Mayor Donald Hahn and Centre County Commissioner Chairman Michael Pipe. STATE COLLEGE — Homegrown company KCF Technologies plans to expand its operations by setting up shop in a third office in downtown State College. This will add 1,500 square feet in space to the growing company. The expansion also will provide more jobs and opportunities for the region. Frank said the company plans to move to the office space in one of the new downtown buildings by March and couldn’t have made the leap without support from the local government. The $1.5 million expansion effort was helped along by a $150,000 investment assistance package from local municipalities, with the county providing $50,000 of support and four local municipalities — State College Borough, College Township, Ferguson Township and Patton Township — each committing $25,000. The municipal leaders see the ability of KCF to create more good jobs as a way to promote economic development to the area. The announcement was made at the Chamber of Business and Industry of Centre County office, with officials from the Centre County Economic Development Partnership in attendance. 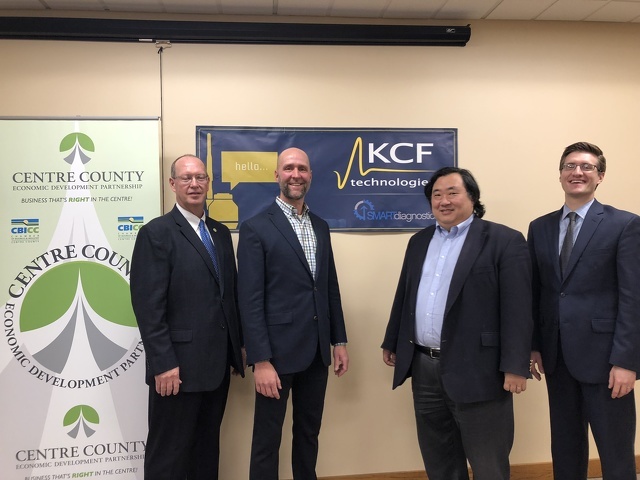 CBICC and CCEDP president Vern Squier said KCF Technologies is a great success story and is an example of the opportunities that are happening in Centre County with the growth of startup companies. The company recently hired its 100th employee and pledges to expand to 200 within 36 months as part of the performance agreement with CCEDP. It also has pledged to lease the new office space for no fewer than five years and maintain its headquarters in State College for no fewer than 10 years. In return, the CCEDP will work to remedy parking concerns for current and future employees and work to ensure that KCF will be able to make its own move-in date of Friday, March 1. “We are thrilled to expand in the downtown area. The CCEPD’s partnership allows our community’s commitment to supporting small business and entrepreneurship, and we are very thankful for that support,” said Frank. He said the speed of the move is important because the company is “bursting at the seams” and needs the new space to keep growing. Of the new jobs, Frank said they are looking for engineers with social skills. For Frank, downtown State College provides a benefit for his employees and allows them to live in an up-and-coming community with easy commutes to work, allowing for more family time. State College Mayor Donald Hahn spoke at the event about how pleased he was to see a company like KCF continue to expand in the borough and bring jobs to the region.